[vc_row row_type=”row” type=”full_width” icon_pack=”font_awesome” content_menu_fe_icon=”arrow_back” text_align=”left” padding_bottom=”10″][vc_column width=”1/1″][vc_column_text]Welcome to the Women in Fantasy Illustration interview series. 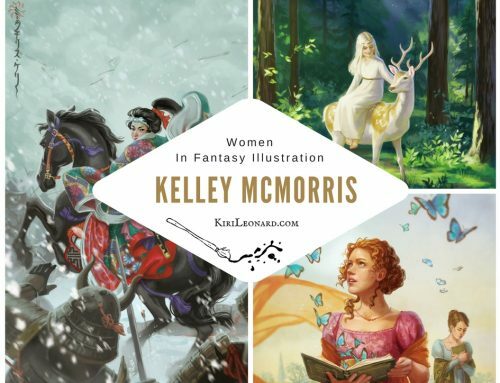 I am interviewing a selection of women whose work have made an impact in the Fantasy Illustration Industry. Today I have the pleasure of sharing a great interview with renown tarot and fairy tale illustrator Lisa Hunt. Lisa Hunt is a veteran of fantasy illustration, she’s also a traditional artist who renders her beautiful work in watercolors. I remember fawning over Lisa’s work before I learned to draw myself so I was very excited to have this opportunity to interview her and share it with you. Lisa Hunt in her studio. 2. 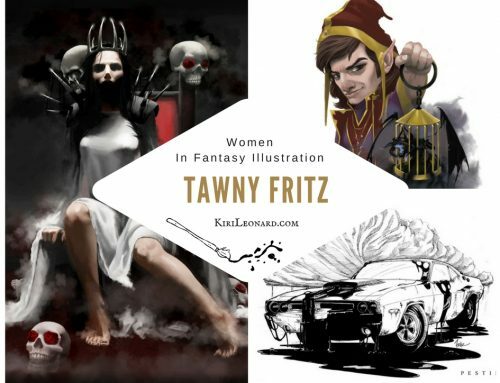 When did you realize you wanted to make a career out of illustrating? 3. You broke into illustration in a different time than what many young artists are facing today. What difficulties did you have to face when you decided to turn professional? That is an interesting question because I don’t necessarily separate myself from other generations. I don’t think one era is necessarily easier than another, just different. Obviously the world of art has been changing at lightening speed due to the digital revolution. When I started out in the late 1980s as an intrepid twenty year-old, there was no internet, but it also felt like a less crowded industry more receptive to new talent. I “hit the pavement” with my portfolio and dreams. I sent out a steady stream of my art samples and project proposals via snail mail. I also networked by going to conventions and conferences. There were very few opportunities to exhibit art otherwise. I was tireless in my efforts until I finally received steady contracts and monetary rewards. It’s a soulful pursuit. I’ve always felt art making is a physiological process. I don’t feel physically centered if I’m not drawing, painting, writing or playing music. It is an integral part of my being that has been a constant companion since I was a little girl. In some ways, creating art is not a choice, it’s a necessity. I think a lot of people in the arts feel that way. You have to work long, hard hours to make a living. That’s the truth and don’t let anyone convince you otherwise! It’s a consuming lifestyle and in some ways it can render an individual somewhat anti-social. I know my mind keeps painting even after I shut the studio lights off. In that regard, social networking is a blessing for those who must live the studio hermit life to make deadlines and keep food on the table. I’ve become a little more laid back over time because I’ve become a faster, more efficient painter — a natural progression as one gains experience. I’m also older now, more reflective and appreciative of my life. [/vc_column_text][/vc_column][/vc_row][vc_row row_type=”row” type=”full_width” icon_pack=”font_awesome” content_menu_fe_icon=”arrow_back” text_align=”left” padding_top=”10″ padding_bottom=”10″][vc_column width=”1/1″][blockquote text=”You have to work long, hard hours to make a living. That’s the truth and don’t let anyone convince you otherwise!” show_quote_icon=”yes”][/vc_column][/vc_row][vc_row row_type=”row” type=”full_width” icon_pack=”font_awesome” content_menu_fe_icon=”arrow_back” text_align=”left” padding_top=”10″ padding_bottom=”10″][vc_column width=”1/1″][vc_column_text]6. Please tell a little about your process and your choice of medium. I’m a watercolorist. 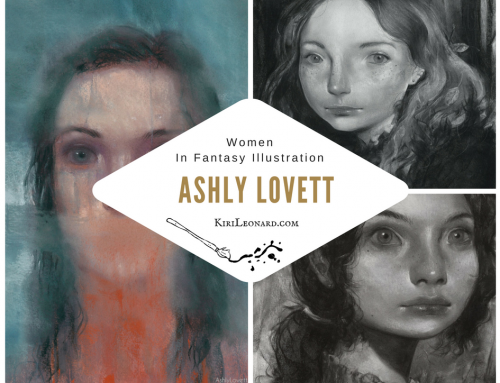 I started out with acrylics and oils until I took an illustration class with Lauren Mills. She was an illustrator in the children’s book field when I had her as a teacher back in 1987. I was spellbound by the process of layering washes of color. It resonated with me and I found it far less messy than other painting mediums. My process: Usually I stretch several pieces of watercolor paper at a time (stapling paper to board). This way I can rotate from piece to piece and maintain an objective eye. Earlier in my career, I would fastidiously draw things out on tracing paper and transfer it directly onto the paper. These days, with a more rehearsed and confident hand, I’m much more spontaneous, and draw secondary elements right onto the paper. It’s an extremely liberating way to draw and paint, employing a certain amount of stream of consciousness. Lisa Hunt painting in her Studio. 7. How has being a traditional artist impacted your career as the publishing world has turned more digital? 8. Much of your work is focused on fairy tales, mythology and legends. 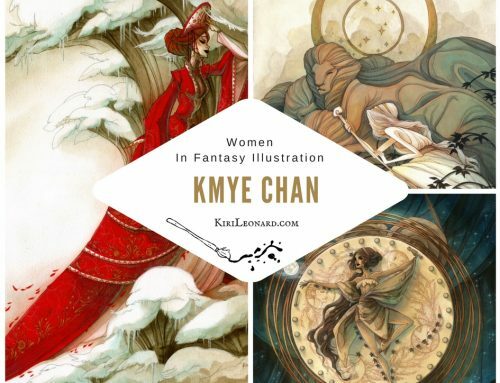 What attracts you to illustrating the fantastical and mythical world? 9. You have an interesting and active blog. What benefits have you seen from maintaining a blog? 10. What is the best advice you have ever received regarding your artwork and career? Thank you for reading, I hope you enjoyed this interview with Lisa. 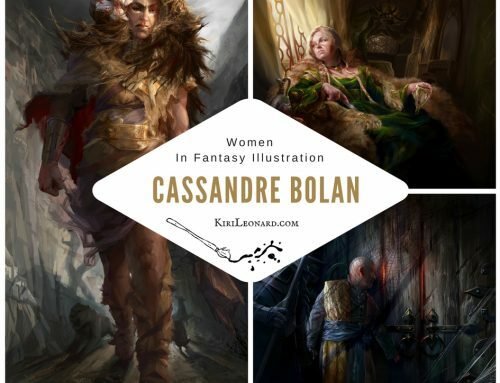 If there are any professional female fantasy artists you greatly admire and would like to see interview with, please leave a comment with their name and a link to their website.